I once had the opportunity to visit the Jin Yong library in Macau. It was upstairs of a shop - this shop. I cannot remember the address, but I suppose Google would be able to tell. Into this shop and up the stairs, this is what it looks like. 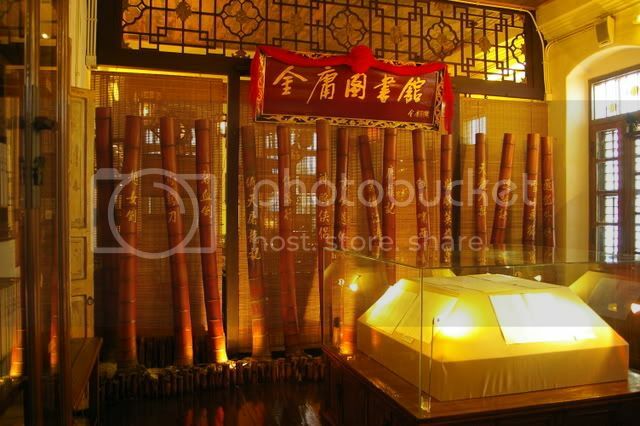 Carved on the pieces of bamboo are the titles of his books. 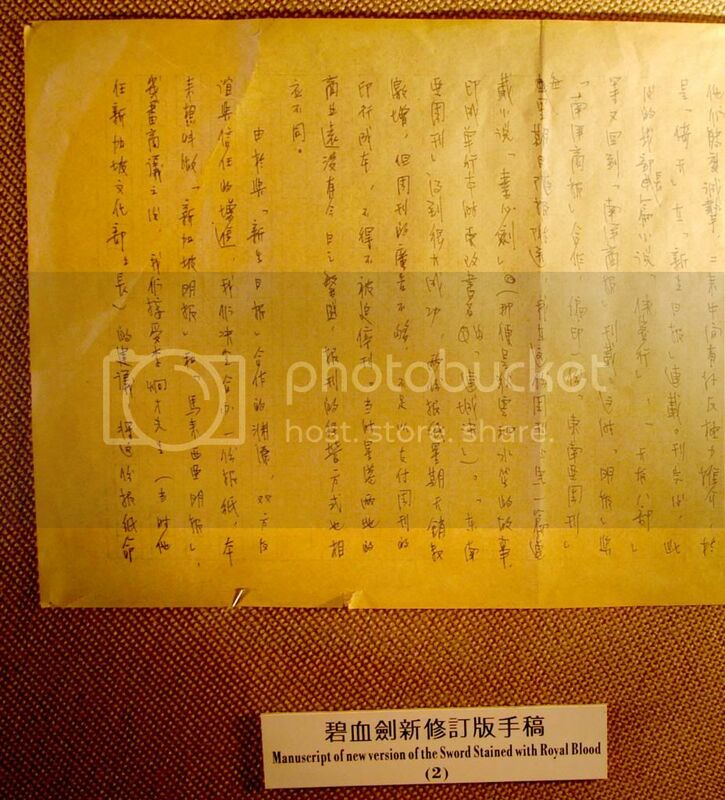 Once of my favoured books written by Jin Yong is "Heaven Sword and Dragon Sabre", a copy of which was displayed. One of the illustrations from this book - I am partial to this type of drawings. 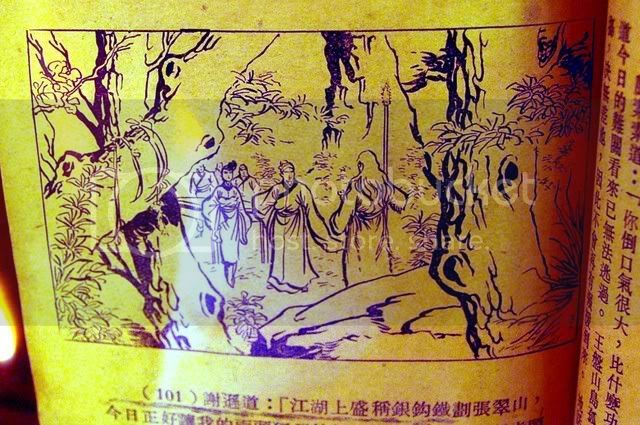 This scene depicts Golden Lion King talking to Wudang's Fifth Hero Zhang ChuiShan and Yin SuSu, daughter of White Brow Eagle King. I believe this would be from the part where the Heavenly Eagle Sect - headed by White Brow Eagle King (but who was not present) - unveiled the (captured) Dragon Sabre to members of the (minor) Clans and Sects of the martial world. interesting! and that looks like a first version copy of HSDS--my dad has a (incomplete) copy of a first version ROCH that he bought at a book clearance years ago. 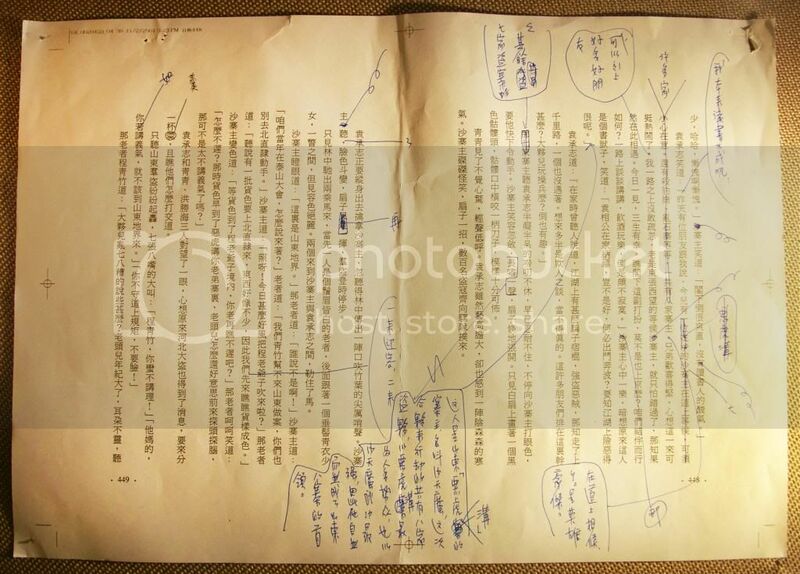 Meanwhile, an example of some of Jin Yong's revisions of his work in his own handwriting, no less! - I presume it is his handwriting anyway. This one was from BiXue Jian. Whoa!!! that's really cool! I wonder if that's really Jin Yong's handwriting. Is this museum is JY's official museum? 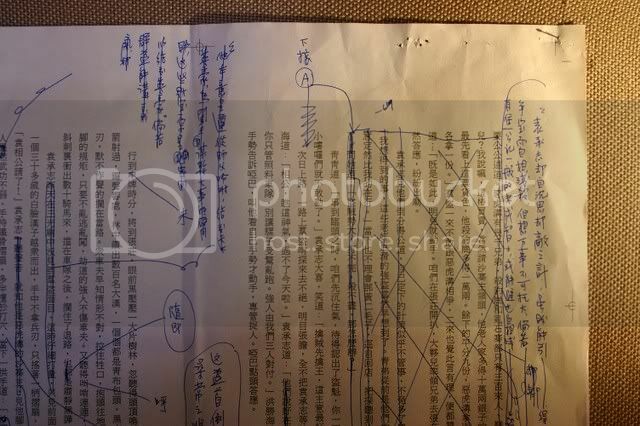 One more of Jin Yong's revision, again of BiXue Jian - I believe this was from year 2001 according to the tiny printing on the top left hand side of the page. 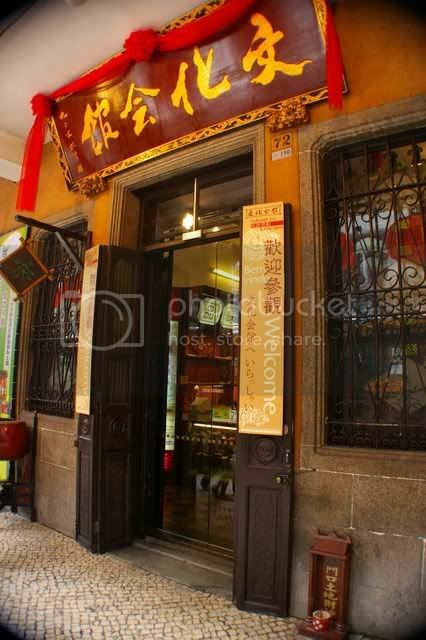 I have no idea if it is Jin Yong's official museum - but I have not heard him complain about it before! This was Jin Yong's revision of BiXue Jian - and this has to be his own handwriting. That's all the photos I have from Jin Yong's museum. Well, all I can say is that Jin Yong's handwriting is better than mine. Actually, when I have the patience and time, I can write Chinese rather beautifully. Whether I get the characters right or not is another question. In other words, my Chinese writing can be beautifully wrong. i can say that my penmanship is abysmal--in both chinese and english. i just happen to know people with beautiful penmanship. Last week, I had opportunity to visit Macau, and of course I had to visit the Jin Yong Library. Sad to say, it had closed. I asked, but the people working there have no idea if it had moved or it had just closed down. I guess I was lucky to have visited while it existed. Too bad !! Thanks for sharing all these beautiful pictures ! 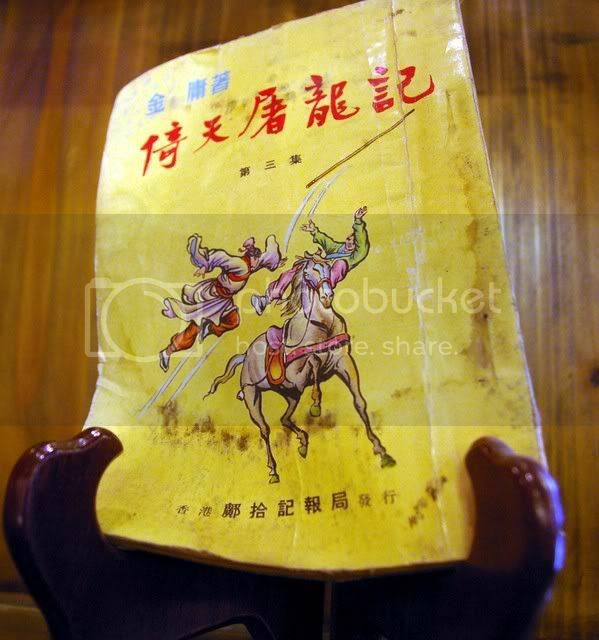 I'd love to get one of these original books, even if I can't read Chinese ! !